Deerfield in 2019: Great Things Are Happening Here! Yankee Candle Offers Holiday Cheer All Year Long! When Michael Kittredge made his first candle in 1969 from a pound of canning wax and four crayons, melting the wax on his mother’s stove top and using milk cartons for molds, he was a high school kid who was low on cash and needed a cheap way to make Christmas presents. Friends and neighbors asked for more, and forty years later Kittredge’s business is the largest candle retailer in the world. 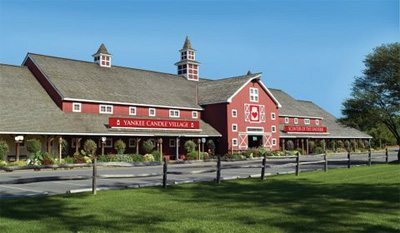 The Yankee Candle flagship store in South Deerfield, Massachusetts, draws three million visitors per year and is one of the largest tourist attractions in the state, second only to the Freedom Trail. 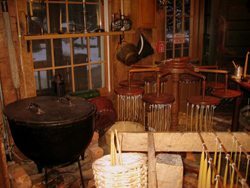 It offers visitors not only the greatest variety of Yankee Candle scents available, but also a unique atmosphere with a variety of interactive exhibits and a Candle Making Museum. 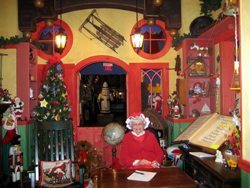 The most popular exhibit is the Bavarian Village, a old fashioned German-style village where it’s Christmas year round and Mr. or Mrs. Claus is never far away. Kittredge created the holiday wonderland after traveling to Germany and becoming inspired by the country’s cozy villages and festive Christmas celebrations. Snow falls from the ceiling year round, and Santa ushers in the holiday season with an annual gala; every year he arrives in a helicopter, thrilling the two thousand people who were waiting to greet him. The Black Forest offers Christmas collectibles and a large selection of ornaments year round, and the Nutcracker Castle contains Yankee Candle Toy where Santa’s Workshop is open year round for visits to the Clauses. The moat surrounding the Castle furthers the spirit of giving; all coins tossed into its waters are donated to the Pioneer Valley Humane society, a local animal shelter. 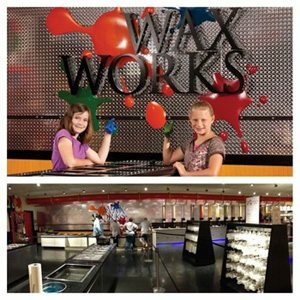 The newest and fastest growing exhibit at Yankee Candle headquarters is Wax Works, an interactive and kid-friendly activity center that includes candle dipping, Make Your Own Jar Candle, and Wax Hands, the most popular of the exhibits. Here visitors line up for a chance to create original wax sculptures by dipping their hands into wax. Seasonally, dip-your-own wax ornaments are available, and at the Make Your Own Jar Candle exhibit, visitors can choose from a selection of different scents, mixing different colored wax beads into original patterns in a jar. The result is a truly unique and personalized candle that burns for 35 hours and produces an array of scents. 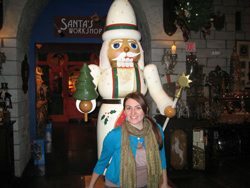 The Wax Works exhibit opened in September of 2008, and has become so popular that it was expanded in time for February school vacation, which is one of Yankee Candle’s busiest times of year. The new Wax Works includes an area for private birthday parties, a popular feature from the past that Yankee Candle brought back, and a much larger Wax Hands exhibit, now expanded to meet growing demand for the wax souvenirs. For shoppers who love Yankee Candle scents and are looking for just the right one, the flagship store offers the ultimate experience. The store carries every current fragrance year round, which means seasonal favorites are always available, and big post-holiday sales make for affordable options. If you’re looking for a discontinued scent from years past, you just might be in luck. While satellite stores move out leftovers to make way for new product, the Yankee Candle flagship store collects past scents in their Treasures section. Upon our visit, we found a White Chocolate Mint candle from four years ago, something that would make a perfect present for a Yankee Candle aficionado. The flagship store is also the first to receive new fragrances, with a section at the front of the store that displays the coming season’s candles. 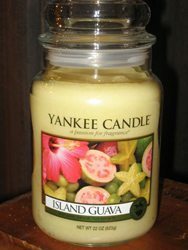 Island Guava and Kiwi Berries are two of the newest scents available now at Yankee Candle. If you’re lucky, you could be asked to sample an upcoming scent at the flagshipstore. Testers from the nearby Yankee Candle factory often gather surveys at the store on busy weekends, asking blind testers to offer suggestions on the color of wax for the upcoming candle. Yankee Candles have stood out from other candle retailers for quality and originality, and for the wide variety of candle scents. But what is it about the candles that make them so special? Bob Merritt, Guest Services Manager at the flagship store, explained why Yankee Candles smell the best: they are scented with real fragrances and oils. Nothing is fabricated. Santa arrives at Yankee Candle every December! If the label says “Tahitian Tiare Flower,” the wax was scented by essential oils from actual Tahitian Tiare flowers. There’s no faking it. The Yankee Candle flagship store offers 90,000 square feet of fun and is open 363 days a year, closing only for Thanksgiving and Christmas Day. Normal hours are 10 AM- 6 PM, with shorter hours on Christmas Eve and New Years Eve. 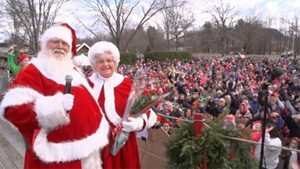 There are numerous seasonal festivals and themed activities, with summer hayrides beginning Memorial Day and running throughout the season. Isadora Medley is a writer working in the software industry in Boston MA. The CDC is Subsidizing Tick Testing! !